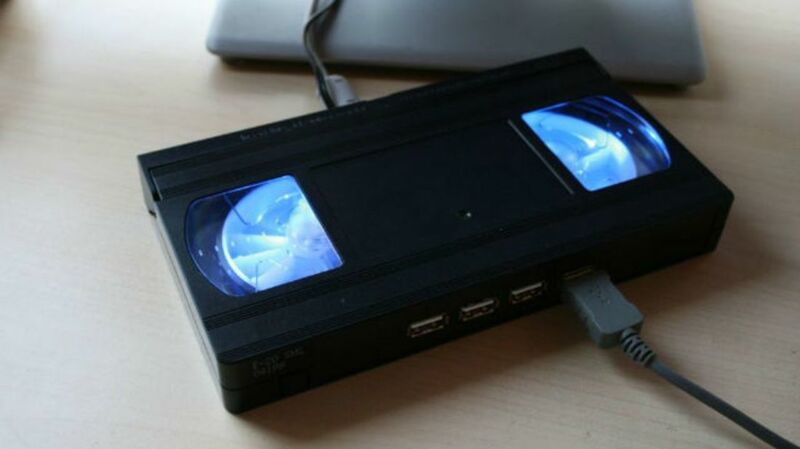 Videocassettes may have gone out of circulation, but that doesn't mean they've gone out of fashion. Take a look at what you can do with your VHS copies of Kickboxer. Eager to show team spirit? Try smashing a cassette real good, pulling out the tape, and winding it around your thumb and elbow. After you've pulled out about half of the spool—the tape should be rewound—tape the bottom and then cut the top. Repeat for second pom. Removing the guts of a cassette—most easily done with flimsy Don Swayze films—and replacing it with a quartz clock movement and battery casing can turn an old relic into a trendy way of knowing when it's time to throw out the rest of your ancient tapes. By crimping the cassette tape and getting handy with a crochet hook, you can make a delightful accessory and potentially wind up on QVC. Any '80s film lover would be delighted to receive your gift when it's wrapped with the remains of Baby's Day Out and other John Hughes movies we'd really rather forget. A wooden board and a little glue are all you need to create an attractive, postmodern statement. Can you build a table in the cloud? No. You cannot. Whether you hollow out a tape or use one of the clamshell cases, old media makes for a perfect storage case. Sure, sure: you want to go green for grocery trips, but those canvas bags aren't doing it for you. Try crocheting this sturdy and reusable sack that makes a fashion and environmental statement. A soldering gun, some LED lights, and a USB hub are all you need to turn this 50-cent garage sale castoff into a conversation piece. Remember how those colored hard shell cases always looked weird and wrong next to all of your regular tapes? They're finally getting their due on your wall: slide pictures into the plastic sleeve and hide your valuables inside. The work of an obvious genius, this game table would be the talk of any recreation room. VHS bird houses with little clothespin perches have been spotted as far away as Belgium. No need to visit IKEA when you have a box full of old tapes: just grab some glue and wall mounts to make some space-conserving wall shelving. Make sure you wear gloves before stretching out a few spools of tape. Once it's thinned out, a rope jig can be used to thread some strong cord.